In today’s health conscious environment, more employees & guests than ever are vegetarian. 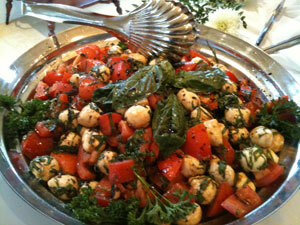 Five Star offers both vegan (on request) and classic vegetarian cuisine. Savory recipes bring together the freshest in organic & select ingredients with imaginative sauces. Creative Vegetarian foods will be enjoyed by all! Menu Pricing: $23 Per Guest 25 – 50 Guests; $20. Per Guest for Larger Groups Plus any Additions Above pricing is valid Monday through Friday, before 5pm. $35 delivery charge and 19% Service Charge will be added to final bill. Pricing includes drop off and set-up of food items, one linen for food table, vase of flowers, rental of all serving dishes & utensils, and disposable dishwares. Minimum 25 Guests. On-site server and china available upon request. Please contact us for pricing.